Solve your trash problems and improve maintenance productivity. 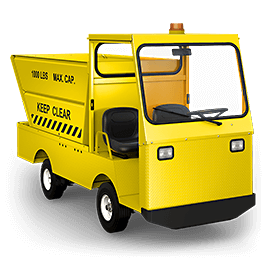 This zero-noise, zero-emission refuse hauler makes a great choice for shopping malls, campuses, resorts and more. It holds an impressive 2 cubic yards of trash, reducing the number of return trips needed per shift. The 48V battery pack relies on a durable 48V hydraulic pump to efficiently equalize cells, thereby improving battery life and performance. Optional cab and roll-out battery compartment. A safe, rugged vehicle with unlimited configurations.